Absolutely Beautiful View from this Falls Condo! Two Pools for your enjoyment! TWO Kitchens in this spacious SHORE Home! Walk in level. Non-Smoking. WIFI available. King size bed in the master, Queen size bed in the second bedroom, Queen bed in the third bedroom, King bed in the fourth bedroom, and a queen size sofa sleeper. 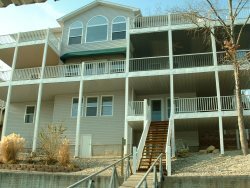 Includes microwave, dishwasher, washer/dryer TV/VCR/Cable, fireplace and a gas grill on the Lakeside balcony. Unit offers a 12x32 boat slip for an additional fee. There is NO boat launch or boat trailer parking on this property. Please make arrangements with a nearby marina. A maximum of 2 parking passes are issued for condo rentals. There is 1 designated space and the other vehicle must park in visitor parking. We are not responsible for parking of additional vehicles. Complex offers two outdoor pools, docks, tennis courts, and playground. The Falls is located at the 2 Mile Marker of the Lake. It offers one of the best locations on the water! Everyone is always helpful and friendly. We look forward to staying there again next year. Please arrive at PMG Lake Ozark Vacations at 3524 Osage Beach PKWY Osage Beach, MO. 65065 between 4:00 and 5:00 to receive the keys to the reserved property as well as any and all necessary property information during business hours unless prearranged differently. If you'd like to request an earlier check in or check out please contact our office at 573.365.3800 the day before your arrival so that you can plan accordingly. In addition, if you will not arrive before the end of business (5:00 pm) on the date of your arrival please notify our office to arrange key pick up from our lock box located on the back side of our building which is a drive thru. Large vehicles, as well as boats and trailers, are not passable so please do not attempt, we are not responsible for any vehicle damages so use your own discretion. Please be sure that you provided our office with a cell phone number in order to reach you after hours in case of emergencies as well as for check in if you plan to check in between 5:00 pm and 8:30 am the following business day. You will be provided 24/7 emergency contact information at check in, please contact this number for any and all emergency reasons that include maintenance or housekeeping.